As can be expected those teams that have a good winning percentage are also high up on the Expt Wins ranking. Keep winning and you’ll consistently outperform your odds and thus your Expected Wins. Dublin, despite their very short odds at times and thus very high Expt Win total, being the poster child for this. The two teams that had the most unexpected run in the Championship – Clare and Tipperary – are both comfortably in the top10 (Tipperary are joint 6th with an Expt Win total of +0.889) as they made a mockery of their odds at times. Indeed Clare also had an excellent league campaign, winning five of their eight games and picking up the Division 3 title, which helped them climb to first in the table. Longford had a lesser league campaign winning three of their seven games but completed one of the shocks of the Championship beating Monaghan away in the qualifiers at odds of 15/2 which accounted for nearly all their positive Expt Win total. Removing the bookmaker’s margin they were expected to win that game ~8% of the time. Perhaps the biggest surprise is Carlow. They won three games in the league for the first time since 2012 (when there was an extra game as Kilkenny played boosting everyone’s win volume in Division4!) whilst also recording only their second Championship win since the end of the 2011 campaign. You won’t read about Carlow having a good season anywhere … but the fact they outperformed expectations to such an extent should ensure it is considered as such. Another way to review a team is through the prism of the handicap. Bookmakers will tell you that they set the handicap line according to what they think their customers will back, thus giving them an even book, rather than the respective merits of the teams. Public perception, along with the strengths of the team, thus feeds into the handicap line. Even still it is quite a good barometer of how teams are expected to perform. So how did teams fare against the handicap and also the two rankings above? Only Louth appear in the Top5 of both the Expt Win and Handicap rankings though in truth all 5 that covered the handicaps most often were also high up in the Expt Wins Ranking. Fermanagh may have only won four of their 11 games in 2016 (two at home in the league, the home win versus Antrim in the Ulster Championship and then away to Wexford in the qualifiers) however they were a tough nut to crack with only 3 teams managing to beat them on the handicap (Cavan winning by 6 in Brewster Park, Derry in the opening round of the league and Donegal in the Ulster championship). Indeed that Cavan game was the only one of the five that Fermanagh played at home where they failed to cover the handicap. We saw something similar in 2015 when they covered in five of the six games played at home. Fortress Brewster! But this all buries the lead. Kerry were excellent against the handicap (see Note1) where they only failed to cover in the opening two rounds of the league, against Dublin and Roscommon, and again in the league final. We have seen a phenomenon of double digit favourites tending not to cover (see Note2) but when a big favourite in 2016 (11 + 10 versus Clare in their two games and 9 versus Tipperary in the Munster final) Kerry covered each time. They don’t get dragged down by “lesser” opposition – they play to their own level. It is no surprise, given that league games can make up 60% to 70% of a poor team’s season that relegated teams feature heavily here. Between them Cork, Down, Armagh & Limerick mustered five wins from their 28 league games. Down didn’t register a win in 2016 however Armagh, despite winning two games, came out slightly worse on Expt Wins. This is due to the fact that they were expected to be competitive in Division2. Outside of the Round6 game away to Tyrone, when the reality of their form was beginning to catch up with their odds, the largest price they were in any league game was 7/4. They also played three (see Note3) Championship games where they were given a good chance of winning each (2/1, 11/10 & 9/4) but came away with three losses. Down on the other hand started slowly and continued to plummet. They may have lost all nine games but were only ever expected to win ~1.96 of those. Armagh were expected to win ~3.96 of theirs. Monaghan had an average league campaign winning three of their seven games when they were expected to win ~3.1 games. Their issues were in the Championship where they had two 50:50 games with Donegal but won neither and then lost as 1/12 favourites at home to Longford. That loss alone equates to -0.893 Expt Wins. This is the “hope you weren’t relying on these guys throughout the year” listing. Similar to the positive performers table there is only one team – Down – that appears in the worst list for both Expt Wins and handicap rankings. Again like the top performers those at the bottom of the handicap ranking are also in the bottom third of the Expt Wins ranking. Waterford & Wicklow appear in the bottom 5 for the second year running. Combining 2015 & 2016 they are running at a 28% cover rate (9 games from 32). We have already seen one of the teams relegated from Division2 – Armagh – appear in the “worst performing” category so it’s no surprise to see the other two teams that filled out the bottom three of that division make an appearance here. Division2 was seen as ultra-competitive at the start of the year and this was followed through with a high volume of games with a close handicap (see Note4). Once teams started to underperform they were going to struggle against the handicap. Note1; what is more remarkable, and a cautionary tale re taking trends at face value, is that Kerry were in the bottom two in this metric in 2015. Then they covered in 31% (4 out of 13) of their games. We must always remember that we are dealing with very small sample sizes (and margins) here where a point or two can have a huge effect. Note2; twenty teams since the start of the 2015 league campaign have started as double digit favourites. Only 7 (35%) have managed to cover this. Note3; Although the first Laois game was declared null and void it was played as if it was a Championship game and we have odds & a result for it so it is included overall. Thinking out loud; In GAA betting the handicap is intrinsically linked to the match price. If those with high Expt Wins (essentially odds on shots) generally cover at a better rate, and the corollary is true for those with low Expt Wins are the linkages between match price and handicap line “out”? 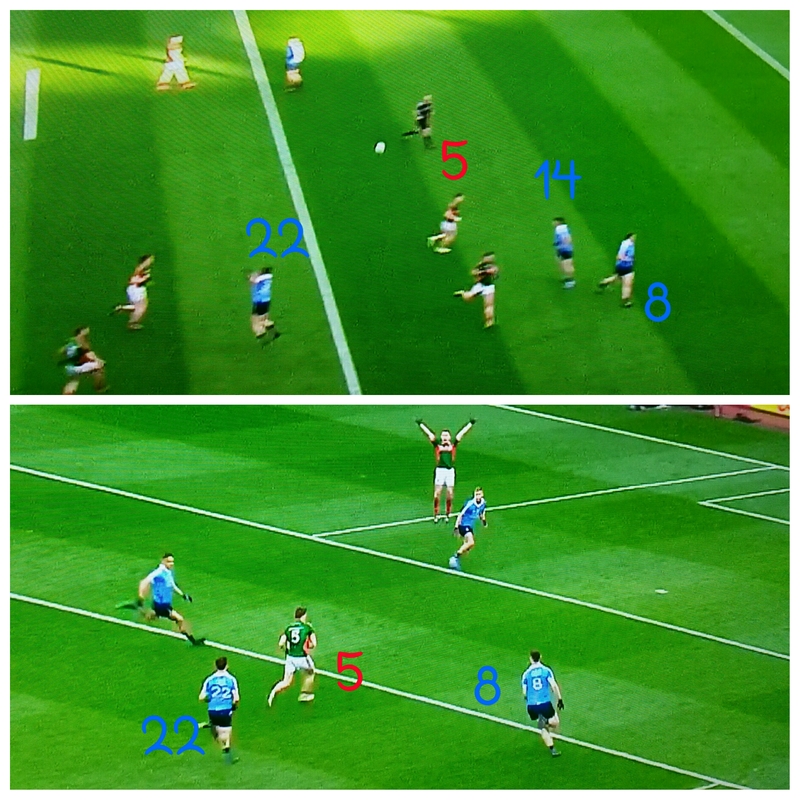 Attack Rates, Shot Rates, Conversion Rates and points per possessions; all the main metrics were incredibly even – as to be expected in a one point game that lasted over 80 minutes – but was there anything in particular that got Dublin over the line? Dublin, and thus Dean Rock, were spectacular on the day from deadballs converting 100% from eight attempts with an Expt Pts of +2.10. 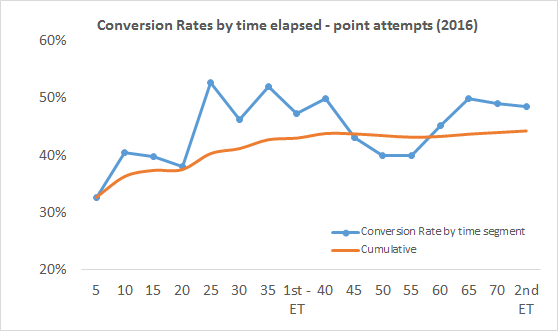 Connolly’s penalty was inch perfect but coming in to the year the conversion rate was 83% (24 goals from 29 shots) so the Expt Pts for a penalty is very high at 2.48. He is expected to convert that. The positive Expt Pts is almost entirely Rock’s. He scored 0 – 07 on seven attempts with an Expt Pts of +1.58. This from the player who returned a Conversion Rate of 43% (0 – 03 from 7 shots & an Expt Pts of -1.58) in the drawn game. He was essentially removed from frees in last year’s final taking just two of the nine Dublin deadballs after converting just 40% (0 – 02 from five) in that year’s semi-final. That was a performance with an exclamation mark. This, along with the performance against Kerry in this year’s semi-final (0 – 10 from 11 attempts & Expt Pts of +2.48), should banish any notion that he cannot deliver on the big day. More on Cillian O’Connor below but both himself and Rock are now clearly the best free takers in the country. 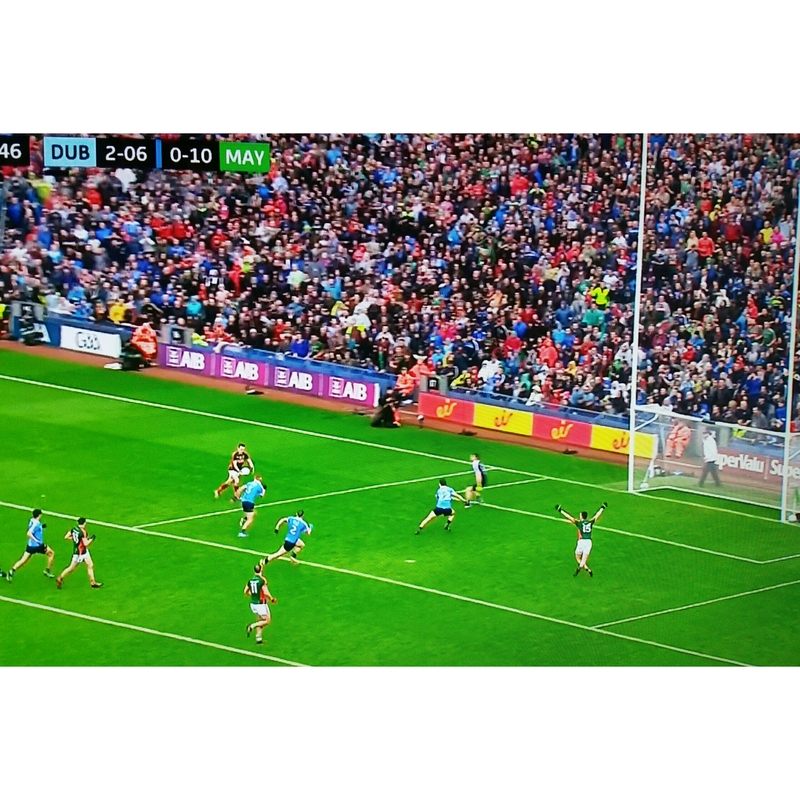 One of the more remarkable aspects of the final was the fact that Dublin did not manufacture a shot on goal from play. They did have a few breaks through the middle, such as McManamon being stripped by Harrison after the long kickout from Cluxton or Fitzsimons strolling through the centre at the death, but never got to pull the trigger. This is the first game since 2012 that this has happened and credit is due to the collective Mayo defence. Especially how they learned the lessons from the first day with Fenton not being allowed drift in behind at any stage. 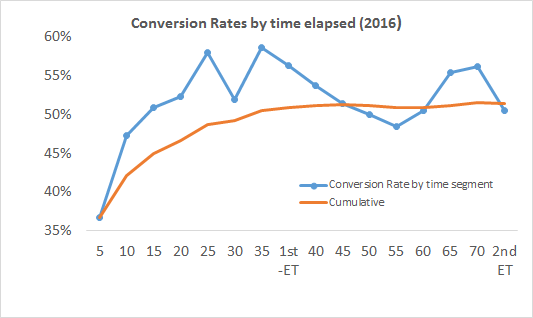 Dublin recorded a 44% Conversion Rate (0 – 08 from 18) and an Expt Pts tally of -1.69 when shooting from play. 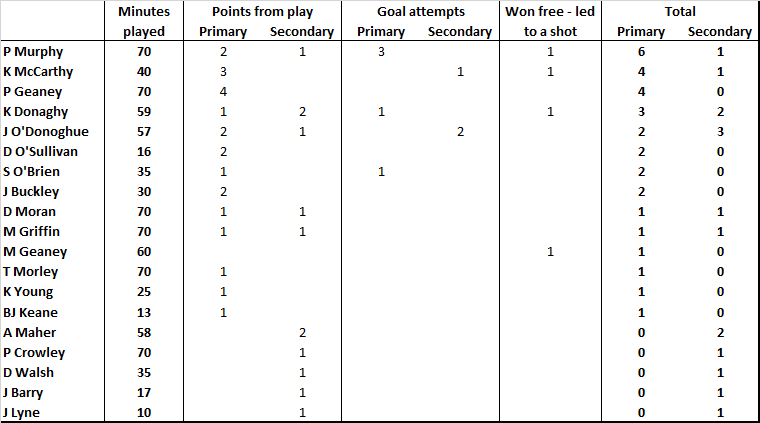 In and of itself this is poor but set against the returns from the drawn game (30% from 20 shots and an Expt Pts tally of -3.03) and how Mayo handled Tipperary and Tyrone (26% & -3.11 and 27% & -3.36) it was a step up. In the drawn game it was highlighted how 50% of Dublin’s scores came from shots with no pressure applied whilst Mayo were able to apply intense pressure to 45% of their shots. Dublin only converted 22% (0 – 02 from 9 attempts) of those taken under this pressure. Mayo managed to apply the same levels of intense pressure here (44%, 8 of 18 attempts) however Dublin’s shooting was better scoring on 50% (0 – 04) as opposed to the 22% in the drawn game. The level of pressure is illustrated b the fact that Mayo blocked three of those eigth but Dublin just squeezed more out. That’s not to say that all their shooting was good or improved. 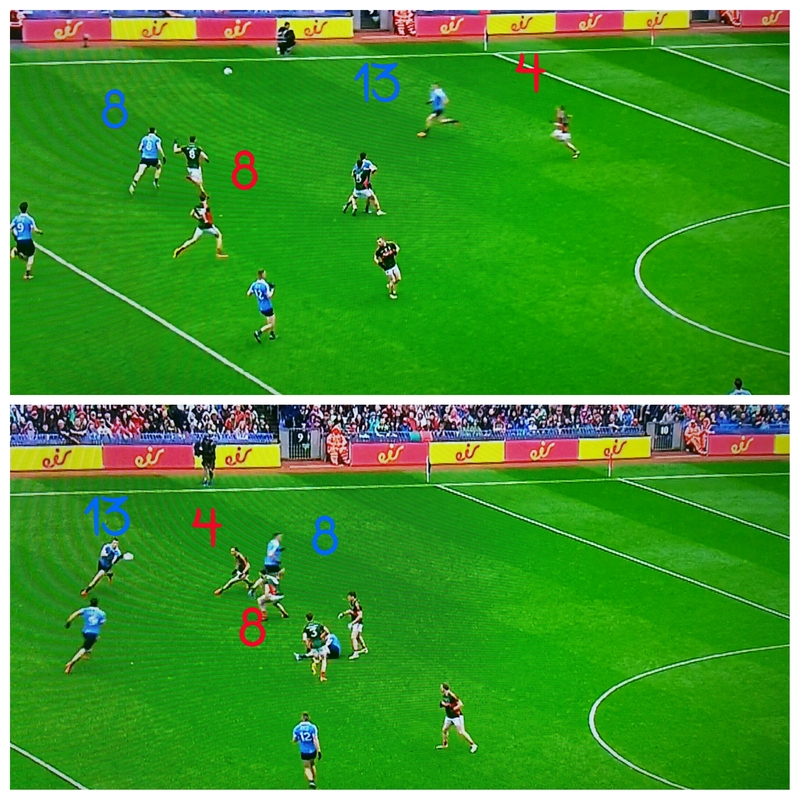 I graded 8 shots where no pressure was applied with Dublin only scoring 0 – 03. Undoubtedly it is due to small sample size randomness but on the day those shooting under intense pressure performed better than those that had no pressure applied. Mayo had one shot at goal and what a shot. A beautiful goal by Keegan. A lot of ink was spent on the run up to the game on the battle between Connolly & Keegan and the impact/intensity of that battle can be viewed through the two point attempts they combined for. On Keegan’s point attempt in the 25th minute it is Connolly flying in to put him off. For Connolly’s point attempt in the 34th minute it is Keegan flying in to try – unsuccessfully – and put Connolly off. I bring the point attempts up above as when Keegan takes the shot at goal Connolly is not in the picture. When S O’Shea launches the ball into A O’Shea on the 45 Connolly (11) has Keegan (5) within arm’s length but doesn’t track him. By the time Keegan pulls the trigger it is Fitzsimons (22) who has put in an incredible shift from trying to block O’Shea’s kick pass to get back on Keegan’s heel. Mayo converted 38% of their point attempts (0 – 05 from 13 shots) with an Expt Pts of -0.85. Dublin managed to properly pressurise five of those 13 shots (38% – similar to Mayo’s 44% on Dublin’s shooting) which was a big step up from the Dublin defence. The last day they only managed to pressurise two, or 11%, of Mayo’s point attempts. Mayo responded well to this pressure scoring 0 – 03 from the five shots taken under pressure. The problem came when they were placed under no, or minimal, pressure. Here they only scored 0 – 02 from 8 attempts (25% – in the draw game it was 0 – 09 from 16 attempts – 56%).As an illustration C O’Shea & Jason Doherty dropped shots into the goalkeeper’s hands from very central positions when under no pressure whilst Andy Moran pulled one wide from the left inside the 20m line. They created the chances – the execution just wasn’t there. Up until the final free kick Cillian O’Connor had been flawless converting 100% of his frees (0 – 09 from 9 attempts) with an Expt Pts of +1.34. This followed on from converting 100% of his frees (0 – 05 frees from 5 attempts) in the drawn game. And then we had that final free. The average, from 2012 -2015, for the area of the pitch that the free was attempted from (sector6) was 64% on 650 attempts. For the same period I have O’Connor converting 75% from this sector (0 – 09 from 12 attempts). Unsurprisingly, given his overall returns, O’Connor has been – historically – above average from this range. His shot charts for frees in 2016 is above. Overall he was 77% with an Expt Pts of +1.28 and 67% in Sector 6. Below his historical averages but nothing untoward. What is apparent from the above however is that there is an arc – in the same shape as the D but starting inside the two “x”s at the 20m line above – outside of which is accuracy becomes human! Every free taker has this arc. Basically his range. But in this instance the final free (marked in the above with a black “x”) is right on the O’Connor’s 2016 arc. 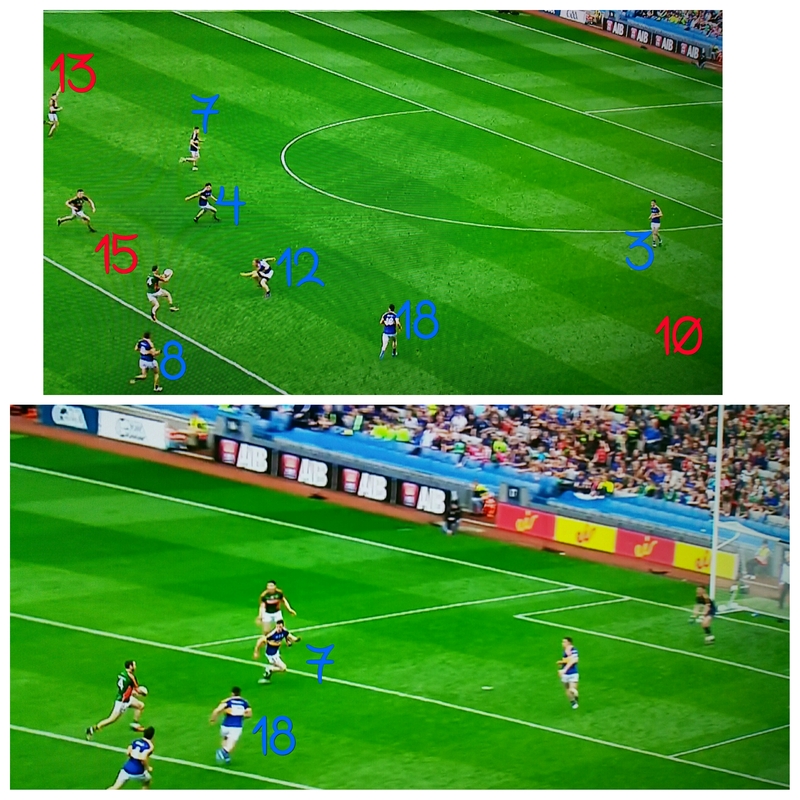 He had two frees from a similar range against Galway and Westmeath converting one and missing the other. Anyone who has read this blog for any length of time knows the esteem I hold O’Connor’s deadball ability in. He is the best around (though Rock has now joined him). There is no one else I would want taking that free but it was no “gimme”. It was right on the edge of his 2016 comfort zone. Mayo won 14 of their 20 kickouts. Of those six were taken by Clarke with Mayo gaining possession on all six whist the split was 8 – 6 in Mayo’s favour when Hennelly was in goal. On its own that looks very poor for Hennelly however of Clarke’s six kickouts we only saw where five landed and of those four (80%) went short. Dublin did not pressurise the recipient on any of these four. Clarke’s kickouts were very safe. A lot has been written about the decision to start Hennelly, and the success of kickouts is as much to do with the outfield players as it is the goalkeeper, but Hennelly was, despite the commentary, coming out on top in terms of end product on the kickouts. Again the commentary was that Cluxton had a superb game from kickouts. He undoubtedly had some absolute peaches in the second half when he pinged two straight to Flynn & McManamon in midfield but is our view of the overall performance coloured by these just after the Mayo keeper switch? Mayo lost six out of 20, Dublin lost five out of 21. Better but by no means outstandingly so. By the time Hennelly had lost six Cluxton had lost four. Mayo had a net gain of four points. Dublin? Broke even. Scored 0-02 from the possessions they gained on their own kickout but also conceded 0 – 02 fro he five they lost. Again a goalkeeper’s role is not all about kickouts. Nor is the goalkeeper the sole reason for a kickout ending to a score. I may be trying to push too positive a spin on Hennelly’s performance (forget trying – I am pushing!) *but* the very negative narrative – in comparison to the very positive one on Cluxton’s – around Hennelly’s kickouts just doesn’t ring entirely true. How anyone can categorically state that this Mayo team is “gone”, or “cannot win” the big one is beyond me. There was the width of a cigarette paper between these teams. And Dublin are considered one of the greats. Goals. They win games and set the tone for how a game unfolds. Mayo had three attempts scoring 2-00 whilst Tipperary, chasing the game for much of the afternoon and after carving out 13 goal chances combined (scoring 4-02) against Derry & Galway, didn’t have one attempt. First up the positive. Tipperary’s deadball accuracy was excellent hitting 0 – 09 from ten attempts and nine on the trot – especially when they needed them – after O’Halloran missed their first one from outside the 45. The Expt Pts for these ten attempts was 8.25 giving a return of +0.75. 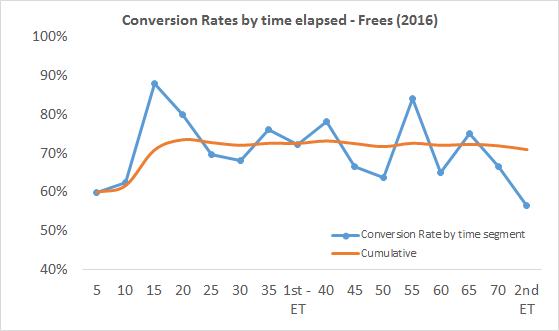 With a conversion rate of 90% an Expt Pts of +0.75 does not appear overly generous however this, as the chart below shows, is an indicator that the frees were of the easier variety and also ties in to the fact that they didn’t have any goal attempts. Mayo were on notice and were not going to let them through. An overall Expt pts of -2.36 incorporating no goal shots and good accuracy on frees leads to some very poor shooting from play. Tipperary were just 26% (5 from 19) on point attempts from play with an Expt Pts tally of -3.11. These weren’t some collection of long range “shoot and hope” efforts either as only two came from outside the 45. This is the second consecutive game whereby a team has underperformed when shooting from play against Mayo (Tyrone were 27% on 22 shots with an Expt Pts of -3.36). At some stage we are going to have to give the Mayo defence some credit for these poor returns! Looking at Tyrone & Tipperary’s 41 shots from play Mayo applied pressure to 66% of them. We don’t use pressure in the numbers but for the last four years 51% of all shots tracked were recorded as being taken under pressure. Accepting that everyone’s definition of pressure will be different we can say that Mayo’s defence has applied pressure at a greater level than is the norm – and their opponents shooting has suffered, at least in part, as a consequence. 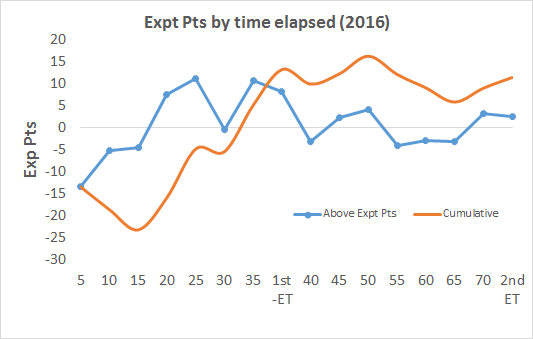 Mayo’s overall shooting was as poor as Tipperary’s with a total Ext Pts of -2.34. But whereas Tipperary were consistent in their issues throughout the game Mayo were gloriously inconsistent. Up until the goal in the 25th minute Mayo were a very poor 25% (3 from 12) with an Expt Pts of -3.84. From play it reads even worse with a paltry 0-01 registered from 8 attempts (13%) including a glorious missed fisted point attempt from the 20m line. And then the goal happened. And then half time happened. D O’Connor responded to Quinlivan’s free early with a trademark strike from the right in the 37th minute and then …. nothing. Radio silence. Mayo managed just two shots – let alone garner any scores – in the next 17 minutes. As brilliant as they had been prior to half time they were inept here. From their 1.11 points per possession – on 9 possessions – prior to half time they now went 11 possessions without scoring. Not only that they managed just five attacks and two shots in that period. 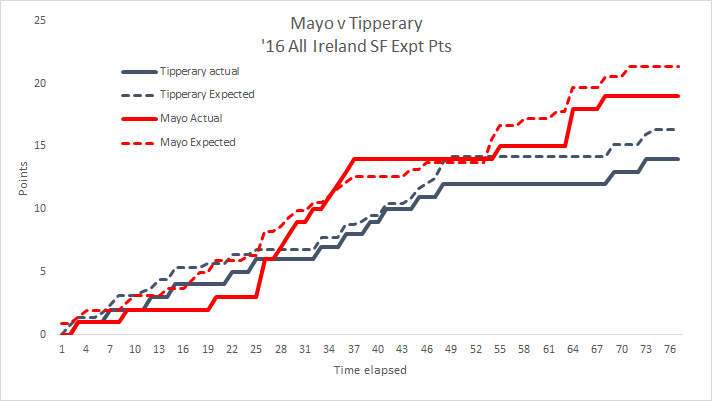 Mayo completely ceded the game to Tipperary who, in that same time period, garnered 17 possessions scoring 0 – 04 from 10 shots. If Mayo allow such a fallow spot in the final you have to imagine that either Dublin or Kerry would punish them at a higher rate than Tipperary did (0.24 pts per possession on those 17 possessions). The build up to the second goal was very fortuitous but there was nothing lucky about the first. Although the move for the goal emanated from a misplaced hand pass involving one of the Tipperary defenders bringing the ball out they were still well set when Higgins approached the 45. They were manned up 4 on 4 (Campbell (3) has McLoughlin (10) on his shoulder just out of picture) with an extra trailing defender (18). It is a testament to Higgins’ speed and close ball control that he was not just able to round Fox (12) but also that the covering defence couldn’t get across to him. By bursting through the defence at speed either Campbell (3) or Feehan (7) had to leave their man and stop the shot. Given how the game progressed that is a fairly phenomenal set of returns. Every main marker (Possessions, Shots, Attack Rate, Shot rate) was in Tyrone’s favour yet they lost by a point. But it was no average one point loss. According to their Expt Pts Tyrone should have won by ~6.5 points. Cranking out the Monte Carlo model (first time this year!) had both teams converted their chances at an average rate Tyrone would have won the game by seven or more points 39% of the time. That’s not just “win the game” – that’s winning by seven plus!! They win the game 91% of the time (90.9% to be precise) with Mayo winning 5.3% and the remaining 3.8% throwing up a draw. Now games are not, thankfully, played on spreadsheets – or within 20,000 simulations – but how did Tyrone lose a game that they should have won 90% of the time? The first obvious port of call is McAliskey’s goal attempt. Firstly it was a beautiful heel turn that absolutely foxed Higgins putting him in the clear in behind. In general you are expected to score 1.18 points per goal attempt. 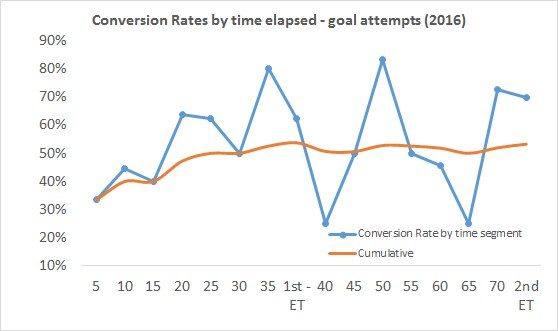 As outlined previously there is an inherent weakness in the Expt Pts for goals as it treats all goal attempts as equal. Over time this will even out but when reviewing one shot in isolation this can look quite harsh. 1.18 points per goal attempt equates to roughly 3-02 for every ten attempts. Do we think, out of ten attempts, McAliskey would score 3-02 from that shot? Perhaps not but I don’t believe it is overly harsh either. Even ignoring the harshness, or otherwise, of how we mark up the goal attempt Tyrone’s Expt Pts from point attempts was -4.76. Breaking that down further it was -1.40 from deadballs and -3.36 from attempts from play. Back to this game. Tyrone were -1.18 from their goal attempt and -1.41 from their deadballs. That still leaves their point taking from play as a quite terrible 27% (0 – 06 from 22) with an Expt Pts of -3.36. Peter Harte and Mattie Donnelly were excellent scoring 0 – 05 from their eight shots combined (Expt Pts. of +1.77). Of course that leaves the supporting cast returning 7% (1 from 14) and Expt Pts of -5.13. That is genuinely appalling and even more so when you consider that eight of those 14 shots occurred either from the central zone around the D or inside the 20m line. And therein lies the heart of how you lose a game you should win 90% of the time; get nothing from your only goal attempt, poor long range deadballs & genuinely terrible shooting from the support cast. Mayo were the opposite. They managed to score ~1.5 points above what an average intercounty player would be expected to. And they needed it as they only managed nine shots in the second half. 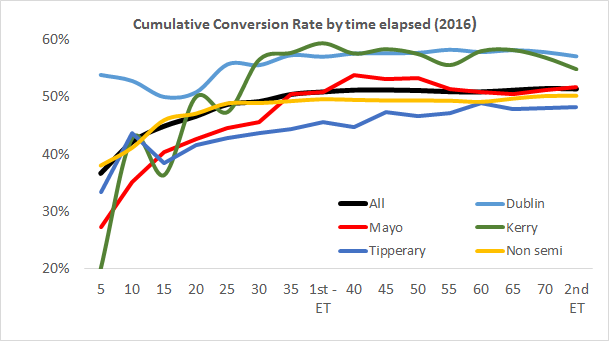 Mayo, in a similar manner to Tyrone, had two players on song with C O’Connor & L Keegan combining for a 71% Conversion Rate (0 – 05 from 7) and an Expt Pts of +1.71. 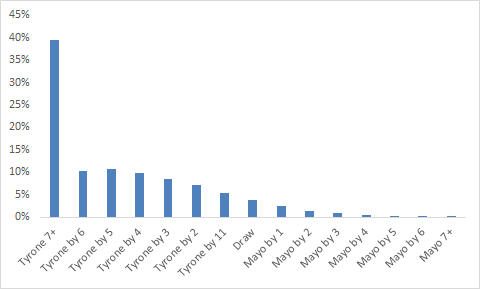 Mayo’s second rank were poor (33% Conversion Rate with an Expt Pts of -0.91) but importantly were good enough to easily outstrip Tyrone’s supporting cast. One final point to note on Mayo’s shooting was what happened post the red card. 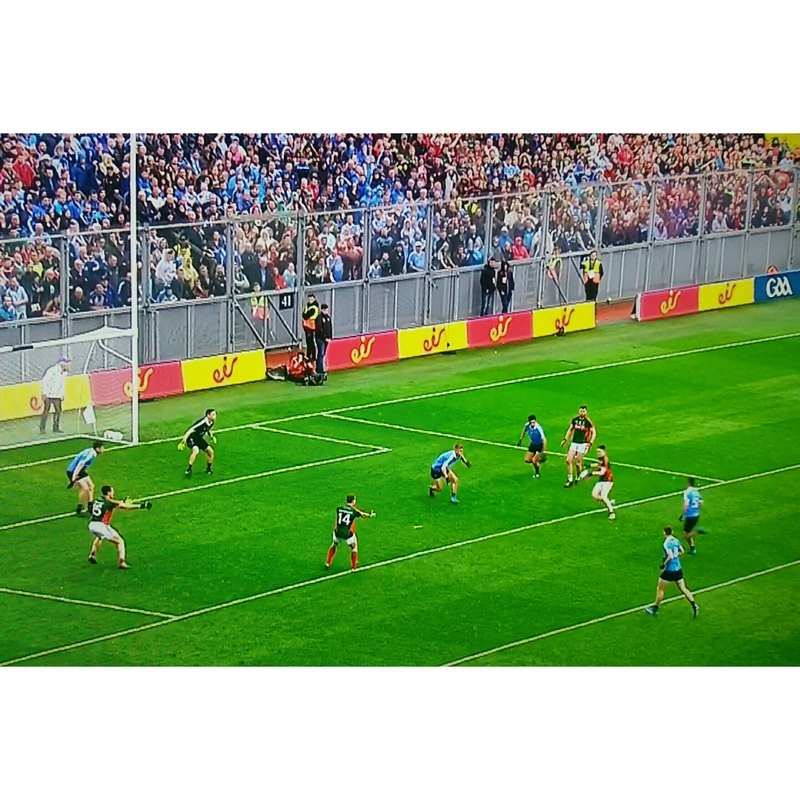 In those fifteen minutes after Séan Cavanagh’s was sent to the line Mayo only managed one shot. One. In that same period 14 man Tyrone managed six. We have touched upon the dearth of accuracy therein but looking forward Mayo cannot go into their shells again as Tipperary have shown, especially against Derry, that they will look to get their main men onto the ball in any tight finish. 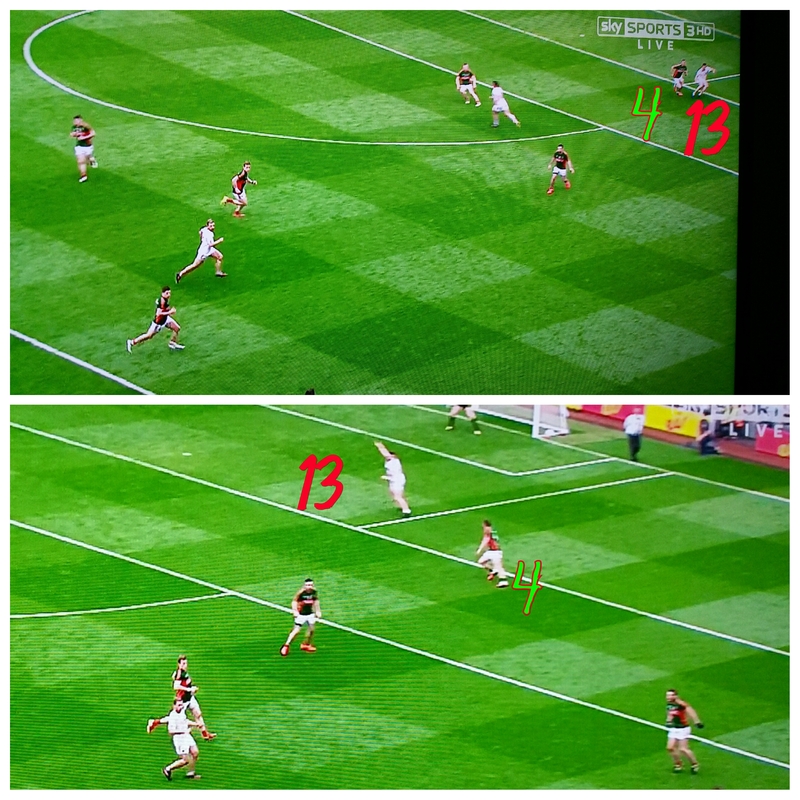 And Quinlivan & Sweeney will get at least three of the six that Tyrone missed. Tyrone went short on 90% of the kickouts we saw (one was missed by the TV cameras) losing the only two that went past the 45. There did appear to be a concerted effort from Mayo to force Tyrone to go up the left wing with their kickouts in the second half with only the very last one in the 64th minute going right. This meant that McCann or McCarron were bringing the ball out. 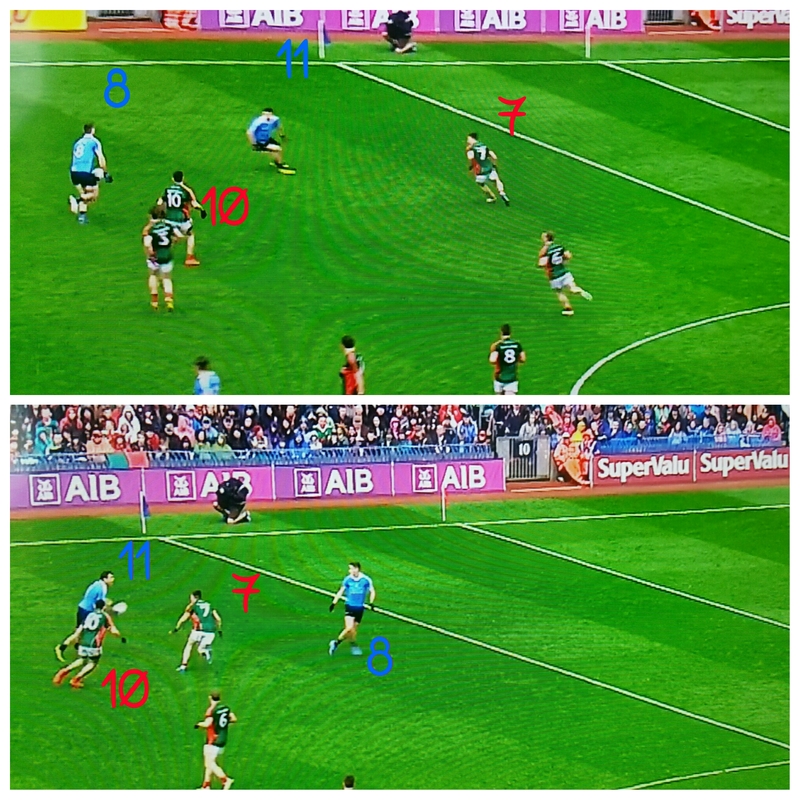 From this vantage it is difficult to see what Mayo were trying to achieve with this but perhaps with D O’Connor & Durcan on that side they felt they had more energy to constantly track up and down the wing. Generally speaking Mayo were comfortable on their own kickout winning 85% (22 out of 26). But that was achieved with a bag of pinpoint accuracy to the left wing (especially two kicks landing on Vaughan & S O’Shea) mixed in with losing three short ones. We can’t leave without looking at those last few minutes. After McCarron’s missed shot at 67:52 only two Tyrone players touched the ball in the next 6 minutes and 11 seconds – those being Niall Morgan with his skewed free and Daniel McCurry’s snap shot after intercepting Clarke’s short pass to Durcan. In contrast Mayo had 3 team possessions with 55 separate individual possessions in that time. Despite seeming like a lifetime to Mayo supporters their players only held the ball for exactly four minutes. Given that Tyrone were sitting back Mayo were never in danger of giving away the ball however as Tyrone crept forward they had to be brave enough and get into the space inside Tyrone’s 45.